Holiday parks in Europe with swimming pool, entertainment, restaurant and much more are the ideal holiday destination for families with children of any age. The children will head to the playground or swimming pool to make new friends while you can settle in peace and relax on the terrace after a long journey. Do you want to enjoy your well deserved vacation? 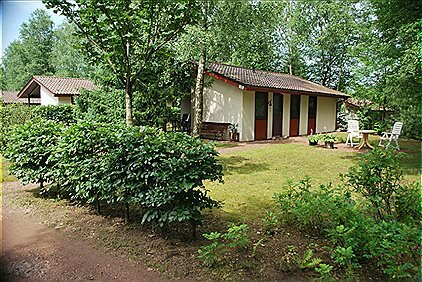 Opt for one of Bungalow.Net's luxury holiday parks in Europe, where many homes have a private hot tub or sauna and where is a swimming paradise and beauty center at the park. Pamper yourself with massages and great food in the restaurant while the kids participate in the activities organized by the entertainment team. Of course you too can participate, as there are activities for young and old as organized sports, treasure hunts and walks through the surroundings. By the beautiful view you get by the water, overlooking the flat mirror with the beautiful nature around it is a popular place to build a holiday park. It is easy to find Bungalow.Net's most beautiful holiday parks on the waterfront. Enjoy the view from your patio or balcony and walk right to the beach for a refreshing dip in the water. Rent a boat, canoe or pedal boat and speed along the surface of the water. A relaxing holiday starts in a holiday park by the sea or a lake. Why visit the Netherlands? The answer to this question is to be found among the unique masterpieces that enrich the country's culture, in places like the Van Gogh Museum, or the Rembrandt Museum; the famous Eleven City cycling route that is like 200 km long; the fabulous beaches on the North Sea Coast; the traditional old mills and canals that give romance a whole new meaning. These are all features that are to be discovered while enjoying a break from the mundane with one of the holiday parks in the Netherlands, from where the country's traditions and modern attractions reveal their infinite charm right before your eyes. It's surely one of the places that is to be on your "must see, experience, enjoy" list. Germany has always been known as being a super power, and we can easily extend this description over its numerous possibilities for experiencing culture, history, nature, winter sports as well as entertainment and of course, its great culinary treasures: they're all super! The laand of not only unique touristic attractions but also of world renowned beer and the delicious "bratwurst", this is a perfect destination for enjoying some great moments with loved ones in one of the holiday parks in Germany. From the beaches on the Usedom Island, to Berlin, Frankfurt, Munich's attractions, the ski region of Sauerland and the great water sports opportunities in the Mecklenburg Lake District, it's all a part of the country's charm. Belgium can best be described by the word "variety", more specifically it has a vast array of activities, natural landscapes, castles, art, history and great cities that offer plenty of entertainment. All of these mix up perfectly into what makes Belgium one of the gems of the olld continent. There's famous and impressive landmarks everywhere throughout the country, like the Manneken Pis in Brussels, or the St. Baafs cathedral in Ghent, all of which are within easy access of our holiday parks in Belgium. Culinary perfection is another feature that defines the country, so it's no wonder that fries actually come from Belgium. The country's charm has yet to be contested by anyone.